This is the eleventh in a 24-part series looking at every episode of The Jetsons TV show from the original 1962-63 season. The 11th episode of The Jetsons opens with a police officer pulling over Montague Jetson — George’s grandfather and a man whose abundant energy and enthusiasm for life dominate the episode. The cop observes that Grandpa Jetson is, “110... and still acting like a man of 75.” With that, we learn that the promises of the 20th century were true: not only will people of the future live longer, they’ll be much happier and healthier. Titled, “A Visit From Grandpa,” the episode first aired on December 2, 1962 and looked at everything from future fashions (when Judy and Jane come home with an assortment of new hats) to sports of the future (when Grandpa Jetson plays with and bests every member of the Jetson family at their favorite sport). 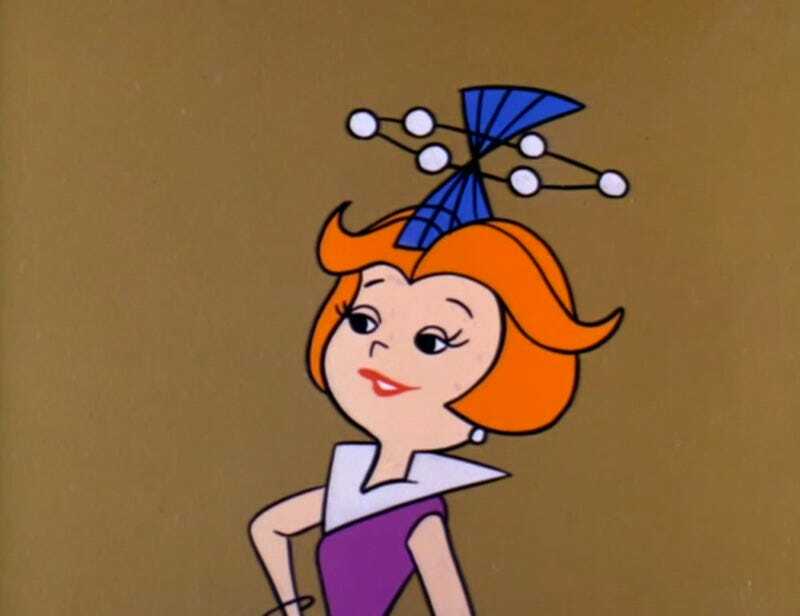 In “The Jetsons” everything naturally has a Space Age twist — even the fashion. When Judy and Jane come home from shopping they model their new hats for George which include names like “Moonscape,” the “Cosmonautris” and the “Nuclear Look.” All of these looks appeal to the googie-tastic flare that we’ve come to associate with mid-century futurism and more often than not, what people of the 21st century call the “Jetsons look.” But these far out styles have roots that extend beyond the 1939 New York World’s Fair. The dress at right was featured in the February 1, 1939 issue of Vogue magazine and was designed by Henry Dreyfuss for the woman of the year 2000. Most of the designers represented agreed that the fashionable woman of the future will be wired for sound, with sending and receiving equipment built into their costume. Fabrics will be treated to be warm in winter and cool in summer. Some will screen the sun to allow tanning without burning while others, used in bathing suits, will make them unsinkable. The article went on to explain that fashion of the future would require plenty of pockets for all the high-tech gadgets and meal pills we’d all be using. A futuristic lounging robe by Dorian, for example is equipped with 40 pockets containing food pills, electrical outlets for instant permanents, and communications systems with robot controls to keep the housewife in touch with the laundry, the nursery, and the kitchen. The chic place for weddings of the future will be the planet Venus, according to Chicago designer Zagri. Her design for a bridal costume is a convertible two-piece ensemble of luxurious gold lame. The voluminous skirt and train comes off to reveal a coverall suitable for a space ship honeymoon. A huge plastic bubble equipped with radar is the bride’s headdress. The rocking chair is a symbol of a slower life — the natural desire to take it easy as one becomes older and less agile. Grandpa’s futuristic rocking chair (or at least the one that George and Elroy are working on for him) is another example of Jetsons technology that doesn’t operate quite as it was intended. Silly jokes like George wobbling around on an out-of-control rocking chair are certainly par for the course during any cartoon, but in the Jetson household they also speak to a kind of conservatism that runs throughout the series. Using sight gags, the show will often argue that messing with symbols of tradition (like the rocking chair) will have unpleasant consequences. And tradition aside, there’s no way Grandpa Jetson needs a rocking chair, since in the future even a man of 110 years old will be as happy and healthy as a person half his age. A serious scientist has glad news for all those that want to stick to this world, in spite of its troubles and worries. In the year 2000, says he, the average life will be 100 years, and many will live to be 200 years old. That will interest birth control advocates, for something in the way of birth control would seem to be necessary in 2000 A.D.
A man and woman 200 years old might easily have thousands of descendants. Providence, however, doesn’t let the trees grow into the heavens. Since the episode revolves around the fact that the elderly will be able to stay active well into old age, we see Grandpa Jetson participate in physical activity with every member of the family. Grandpa shows that he can keep up with Judy’s dance moves, he can both pitch and catch against Elroy in spaceball (which bares a striking resemblance to baseball), he can best George in bowling, he can sky-ski with Jane, and he can play catch with Astro. The Jetsons, as we’ve seen, most often want to present viewers with something relatable to a mid-century audience. With this in mind we understand why our family of the year 2062 all participate in sports that are familiar to the people of 1962 rather than completely fabricating a new sport. Just add “space” “sky” or “nuclear” to anything and voila: it’s been futured. Or more appropriately from the vantage point of the 21st century: it’s been Jetsoned.